LOS ANGELES Appearing on Jimmy Kimmel’s show might not be the highlight of Justin Turner’s week anymore. Eight of the nine Dodgers starters (including pitcher Kenta Maeda) had hits in the game. Eight players drove in runs, including 11 by Turner (five on a pair of two-run singles and a bases-loaded walk) and Cody Bellinger (six), who homered twice. 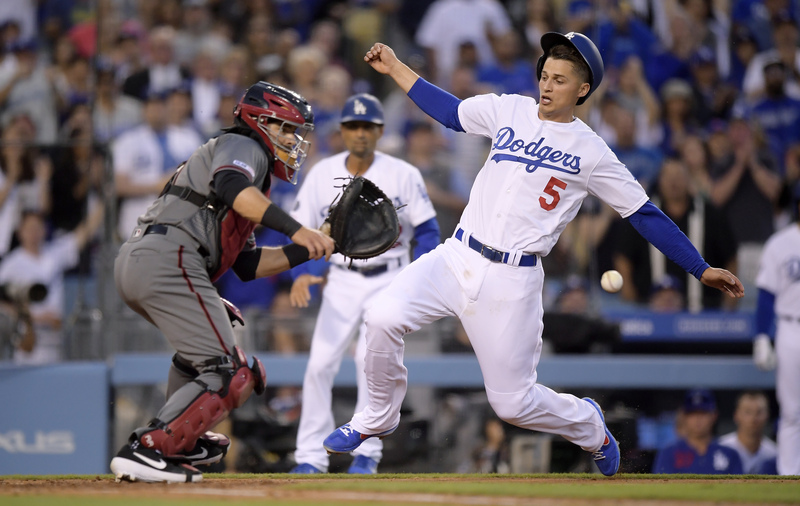 Turner’s teammates put Diamondbacks starter Zack Godley in peril in the third inning Saturday with a leadoff single by Austin Barnes and a sacrifice bunt by Maeda that Godley botched. The Dodgers made Godley throw 29 pitches that inning — a stressful workload that has become a staple of their offense in the early going. They worked Zack Greinke for 30 pitches in the first inning Thursday (one run) and Robbie Ray for 33 in the third Friday (two runs) before pushing Godley on Saturday. The Dodgers blew the game open with a five-run sixth inning. The Diamondbacks raised an early white flag after that, sending Murphy in to pitch the seventh and eighth innings. His first pitch floated in at 51 mph. If his strategy was to stay “under hitting speed,” it didn’t work. The Dodgers scored seven times in the eighth inning against him.